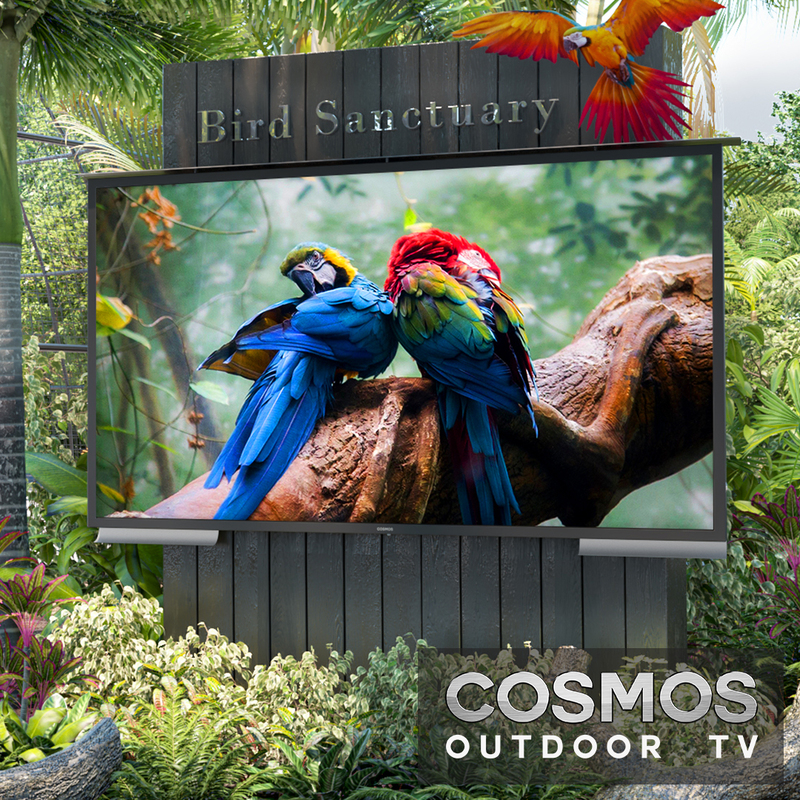 Cosmos Outdoor TV will let you explore what you can’t with other Outdoor TVs. There is only one Cosmos Outdoor TV for the ultimate outdoor entertainment. Cosmos Outdoor TV, Evervue USA Inc.’s best-selling product, is available from 32” to 100” screen sizes. It is perfect both for residential and commercial use. Evervue USA Inc., a frontrunner in the industry of manufacturing Outdoor TVs, Bathroom TVs, Kitchen TVs, and Smart Mirrors since 2001 launches the world’s first-ever largest outdoor TV. Cosmos Outdoor TV, Evervue USA Inc.’s best-selling product, is available from 32” to 100” screen sizes. It is perfect both for residential and commercial use. Its superior and state-of-the art features and technology include non-reflective screen for the best viewing from sunrise to sunset. The Cosmos Outdoor TV reimagines the ordinary outdoor TV with revolutionary size, smart technology, installed with latest Android smart TV and Google Voice Assist, boasting 4K Ultra HD picture quality and premium sound system that is second to none. The Cosmos Outdoor TV is designed for extreme weather conditions such as direct sunlight, rain, and snow. It is safe to use even when installed near any wet areas such as outdoor grass, pool, or hot tub because it is 24 Volts safe. This all-weather outdoor TV is also water and heat resistant with its built-in insulator. The Cosmos Outdoor TV offers different mounting options and installed with a durable TV housing. For extra protection, it is built with the unique weather cap and offers Neoprene covers that come in many colors and patterns.